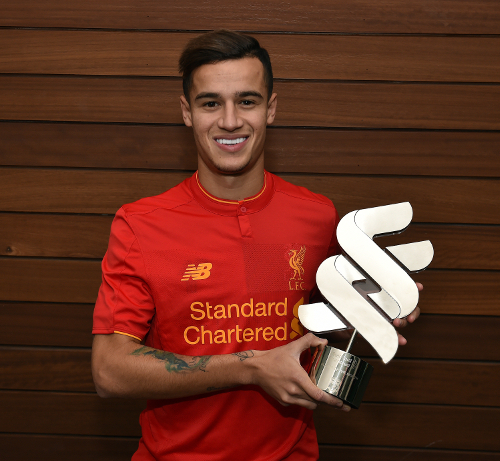 Philippe Coutinho was today named as Liverpool’s Standard Chartered Player of the Month for October, but insisted the award was as much for his teammates as it was him. The Brazil forward helped the Reds extend their unbeaten run to 11 matches, featuring in four of our fixtures and scoring what proved to be the decisive goal in the 2-1 victory over West Bromwich Albion at Anfield. Coutinho picked up 56 per cent of the votes in a poll on this website to clinch the October accolade, pipping Roberto Firmino (14 per cent) and Joel Matip (five per cent). 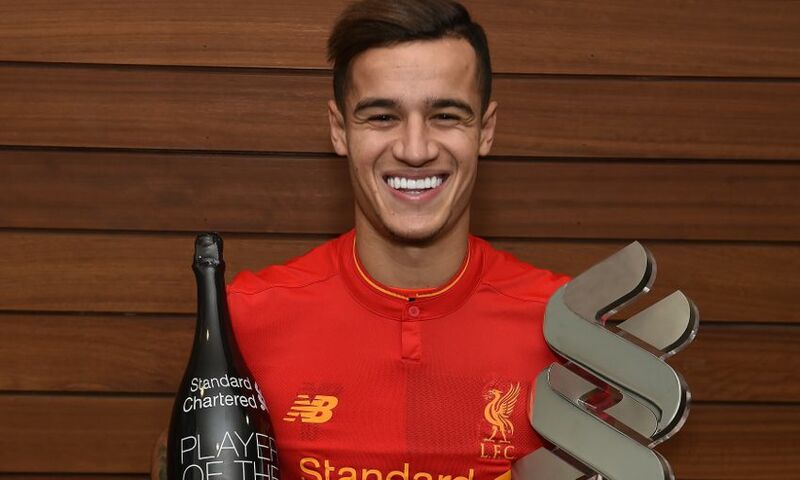 Upon being presented with the trophy at Melwood on Thursday, he told Liverpoolfc.com: “I am happy to have won the award, but as I always say the most important thing is that the team have played well throughout this month. We have achieved excellent wins but we must continue to work hard to continue this winning trend. “My teammates have been very important to me winning this because football is a collective sport, so when the collective performs well that means everyone is doing an excellent job. Coutinho’s outstanding form in 2016-17 far extends beyond the month of October, with the 24-year-old forming a devastating attacking triumvirate with Roberto Firmino and Sadio Mane, as well as the likes of Adam Lallana, Daniel Sturridge and Divock Origi. Indeed, the Reds are joint-top scorers in the Premier League so far this term with 24 strikes. “Liverpool have a group of players of excellent quality here,” Coutinho added. “All our players are top quality. Not just the ones that come in to the side, but the ones who are also working for a chance to go out and play. “Everyone performs to the top of their capabilities, so that is good for the manager and fantastic for Liverpool. Plaudits for Coutinho’s form – which in total has yielded four goals, four assists and 25 chances created in the Premier League so far – has come from far and wide. Not least from those fortunate enough to play alongside him, including Dejan Lovren, who earlier this week declared him the division’s best player on current form. “It was very gratifying receiving that from a brilliant player; a huge compliment from a big player like Lovren, who is also a great friend,” Coutinho smiles. “It is very important – I was very pleased and happy with his kind words. “I feel very happy [with my form] but my aim is not only to play well; my aim is to win things and trying to improve my football by giving my best at all times.